Ever since Curiosity landed on Mars in 2012, the rover has made numerous groundbreaking discoveries about the Red Planet. These include confirming how Mars once had flowing water and lakes on its surface, evidence of how it lost its ancient atmosphere, and the discovery of methane and organic molecules. All of these discoveries have bolstered the theory that Mars may have once supported life. The latest discovery came on Thursday, May 7th, when NASA announced that the Curiosity rover had once again discovered organic molecules. This time, however, the molecules were found in three-billion-year-old sedimentary rocks located near the surface of lower Mount Sharp. This evidence, along with new atmospheric evidence, are another indication that ancient life may have once existed on the Red Planet. The new findings appear in two new studies – titled “Organic matter preserved in 3-billion-year-old mudstones at Gale crater, Mars” and “Background levels of methane in Mars’ atmosphere show strong seasonal variations” – that were published in the June 8th issue of Science. As these studies indicate, these molecules – while not evidence of life in and of itself – have bolstered the search for evidence of past life. In the first paper, the authors indicate how Curiosity’s Sample Analysis at Mars (SAM) suite detected traces of methane in drill samples it took from Martian rocks. Once these rocks were heated, they released an array of organics and volatiles similar to how organic-rich sedimentary rocks do on Earth. On Earth, such deposits are indications of fossilized organic life, which may or may not be the case with the samples examined by Curiosity. In the second paper, the team described how Curiosity’s SAM suite also detected seasonal variations in methane in the Martian atmosphere. These results were obtained over the course of nearly three years on Mars, which works out to almost six Earth years. 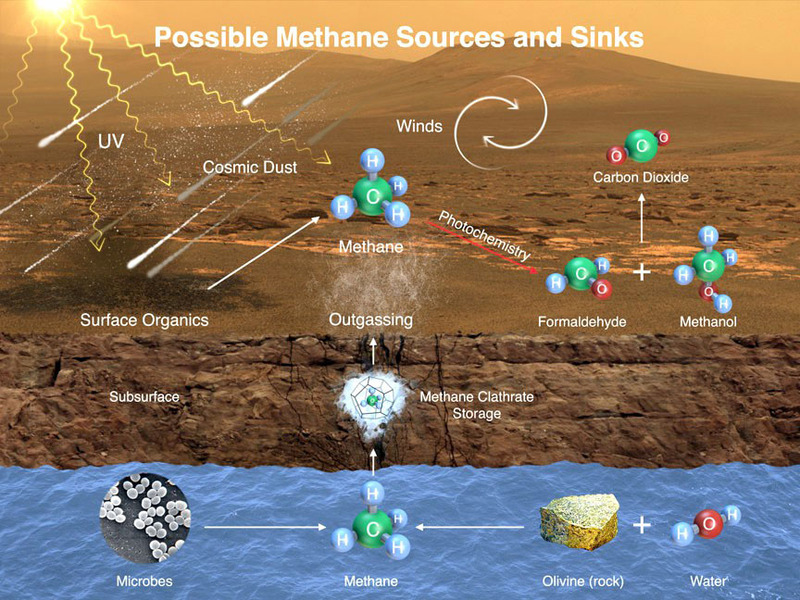 While the team admits that water-rock chemistry could have generated the methane, they cannot rule out the possibility that it was biological in origin. To find this organic material, Curiosity drilled into sedimentary rocks (known as mudstone) in four areas in the Gale Crater. These rocks formed over the course of billions of years as sediments were deposited at the bottom of the ancient lake by flowing water. The drill samples were then analyzed by SAM, which used its oven to heat the samples to over 500 °C (900 °F) to release organic molecules from the powdered rock. These results indicate that some of the drill samples contained sulfur (which could have preserved the organic molecules) as well as thiophenes, benzene, toluene, and small carbon chains – such as propane or butene. They also indicated organic carbon concentrations of about 10 parts per million or more, which is consistent with carbon concentrations observed in Martian meteorites and about 100 times what has been previously detected on Mars’ surface. In the coming years, additional missions will also be searching for signs of past life, including NASA’s Mars 2020 rover and the European Space Agency’s ExoMars rover.The Mars 2020 rover will also leave samples behind in a cache that could be retrieved by a future crewed mission for sample-return analysis. So if there was life on Mars (or, fingers crossed, still is) we are sure to find it soon enough!